I wasn't sure the weather was going to be good today, but luckily the hard snow held off until we were finished with class. The children had a ball today. We were discussing Groundhog Day and shadows. We did a lot of light play. I had all the children bring in flashlights today and just have good time with them. 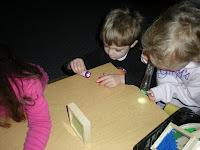 At the beginning of free time we went around the room and made as many shadows with as many items as we could find. 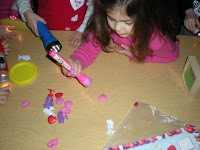 Then I just let them play with the flashlights--lots of dancing and spinning lights. I had kept the lights off so that we could see the shadows and light from the flashlight better. I was a little disappointed. 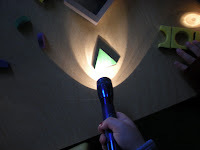 I had planned a shadow game where I was going to put items in front of the light table shining on the wall, then have the children guess what was making the shadow. Unfortunately, the light from the table was not strong enough to cast a good shadow. This is the time you would like to have an overhead projector. 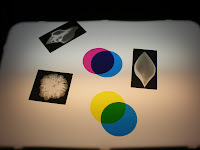 I also had the light table out for the children to play with. 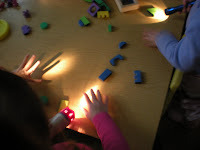 Today was our day of "light play in the dark"
I had the children write their names on the papers first, if they wanted, they are so proud they can do this. 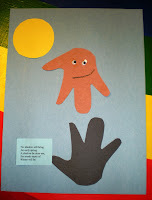 Next, I traced the children's hands on a brown piece of paper. They held their hand so that the thumb and pinkie were the groundhog's "arms." Then one finger was one "leg," and two fingers together were the other "leg." 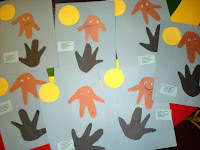 I then cut out the hand shape from the brown and black paper. The children then glued down sun, groundhog, his shadow, and a little poem. 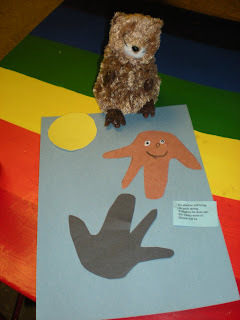 We finished off the picture by adding wiggle eyes and other face features to the groundhog. Our light play went a little long so we missed story today, but I wanted to give you some groundhog books we have at school. I know there were some searches for groundhog stories. I had planned on reading "Groundhog Day," by Betsy Lewin. It's a very basic reader about the day and what goes on. It's written in story form and has cute pictures to keep the kids attention. 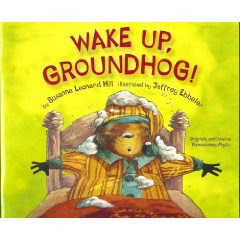 Some other stories we have at school our: "Wake Up, Groundhog!," by Susanna Leonard Hill, illustrated by Jeffrey Ebbeler. 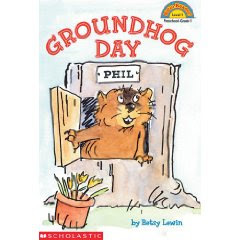 This story is about a little goundhog girl that wants to be Punxsutawney Phil when she grows up. Everyone keeps laughing at her and telling her she can't do it because she is a girl. Will Phyllis overcome her hurdles? 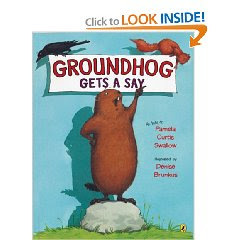 "Groundhog Gets a Say," by Pamela Curtis Swallow, illustrated by Denise Brunkus is about a groundhog who is a little upset that after February 2 nobody finds him that important. 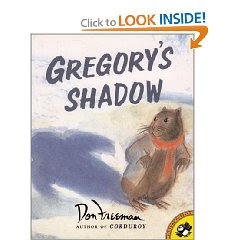 "Gregory's Shadow," by Don Freeman, author of "Corduroy," is also a cute groundhog story about a groundhog and his best friend, his shadow. The two get separated and the story is about the two of them finding their way back to each other.